Does it look like this I also had an issue with that paint but it is hard to trace down. So what happened with my 1000 was it ended up having a nat gas manifold they just stuck a regulator on it fired it up thing went past 700 and pretty much the lid sides were toasted. Ended up getting a propane manifold from another member on the other gasser forum. 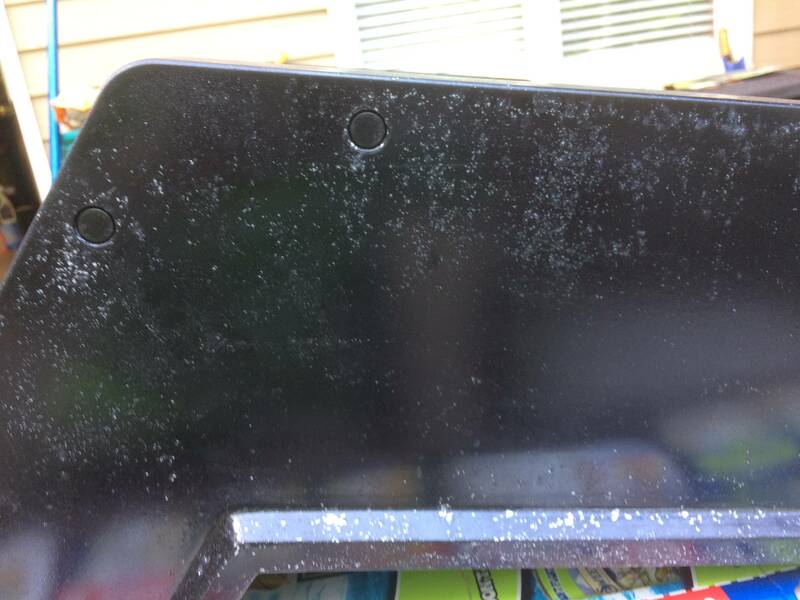 However could have been other issues with that paint and it was in the prep, had done what I thought was a good job using simple green to degrease it and took care to rinse it but I did not wipe it down when I was done with acetone or denatured alcohol and I think this was an issue. Thru some searching I did recently I came across on a painting metal site that simple green can leave a slight film so it needs to be wiped down with a solvent before painting. Because I was so unhappy just took the lid apart I have a performer also so was not without a grill. I took my wire cup brush and just took it down to pure metal as you know there is a texture on those lids and nobody has been able to replicate it. Then the usual used simple green and rinsed off then wiped it down with acetone. What I would tell you as I originally thought was the simple green and a good rinse was enough for prep it was not when I wiped it down with the acetone it still was picking up the remnants of that black paint I had wire brushed off. I just sprayed them last week putting it back together use 900 degree caliper paint high gloss it is and a pain since like any gloss paints its multiple coats to get it to look a uniform gloss. I did not get them perfect but pretty good and it is grilling season so need to get her done. I can update the results in a few months if anyone is interested and I will take a picture of the way they turned out. They have been using the rust ultra for many a restore over there personally I was not happy with it could be me being a lousy spray painter. But Jon has recently been trying the Krylon Paint which is more difficult to find but here is a link https://www.mscdirect.com/product/details/00264853. I wanted to try it myself I knew about it but my local HD and Lowes did not carry it. Mine looked fine until the cover laid on it. That's when the problem became evident. I will try contacting Rust-oleum and see what they say. I had something similar happen when I refinished an original Weber wood handle. I gave all three handles two coats of Helmsman spar varnish. Let them dry for two days and then put them back on the kettle and covered it with a Weber cover. Couple of days later I uncovered it and found the lid handle had the fabric impression in the varnish. The varnish did not turn sticky though. Maybe something to do with the sun heating the cover and somehow softening the paint? Chemical reaction? Yep that's exactly how it looks and went Jim. But this is supposed to be 800-1200 degree paint. I don't think it gets much hotter than 500 here in central FL in the summer lol. I have a feeling I'll be stripping it down to bare metal again. Rub I still think it was an adhesion problem. However you are in FL humidity is an issue both the Krylon and the Rustoleum if you try to spray it with more than 85% humidity its an issue as both recommend you don't do that so not sure that was the case when you sprayed it. The ultra is good for 648 continuous yes it can take a spike to 1200 the Krylon is 600 take a spike to 1200 that is not an issue with the 1000's they generally get to 550 and change. Its a can of worms when you take them down to bare metal which I just did by the way with the cup brush need to rub it down with acetone after using simple green or whatever to degrease it and you need to use more paint. I have not used the Krylon before which I had seen it because that paint can be re-coated at anytime unlike the ultra. I am new here you just stated that yours looked like Cells how do you view pictures in these threads I can rarely see them. Rub, I just looked over my Jr that I had also refinished with the high heat ultra and found the same thing happening. But not where the cover would be touching it. I don't remember how hot or humid it was when I repainted it. Maybe the paint doesn't like to stick to smooth cast aluminum very well. Yes that rust-o-lem branded high heat paint is no good... as you guys have found out it never truly hardens so every time it gets up to temp it becomes slightly tacky again. oddly enough rust-o-lem also manufactures TREMCLAD, but I've had much better success with this one. Might be worth a try if you can find some down your way. That resto came out beautifully! I finally got the Owner's Manual/Recipe book yesterday. It includes directions on assembly from the bottom up. I can see how that would have turned a lot of people off. 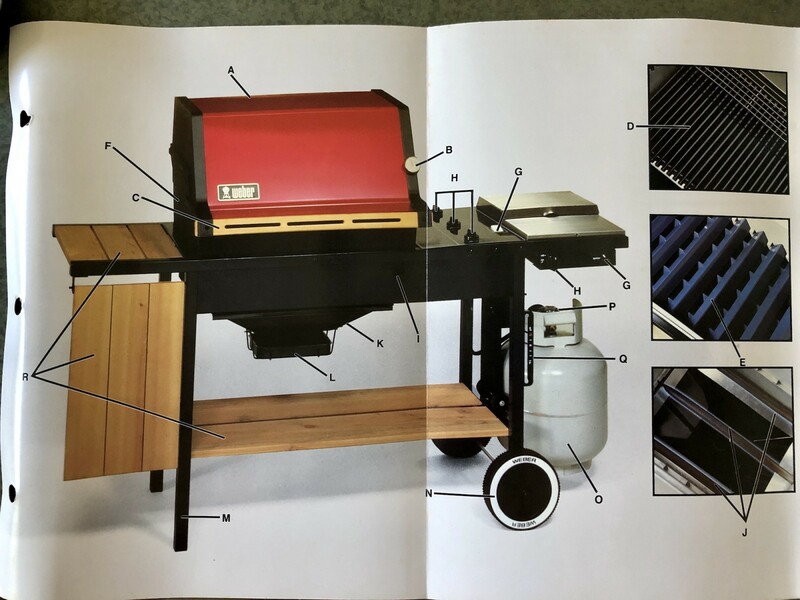 I like this fold out picture of the grill. The wood they show is much lighter than I expected, I like the darker look better. Rub, you have a real classic there. Very nice addition to your kettle collection.